Bed 7 is the triangular bed in the corner of the garden. 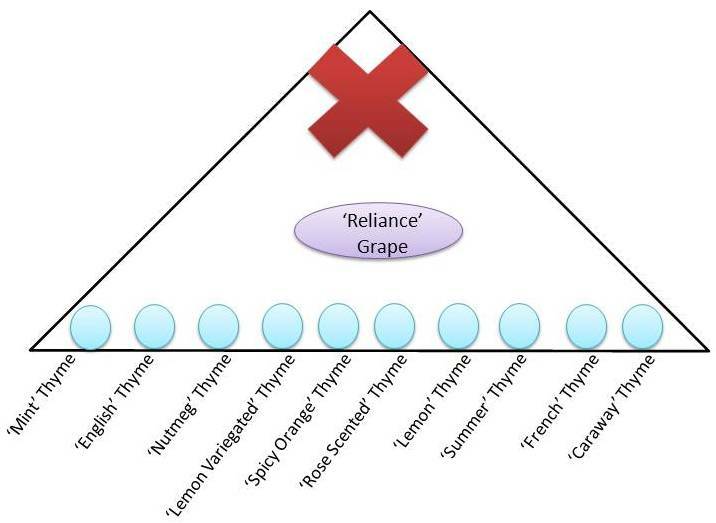 It contains the ‘Reliance’ grape vine and trellis as well as a variety of culinary thymes. English – Thymus vulgaris– Essential in bouquet garni, most common variety. Summer – Thymus vulgarus– A superb culinary thyme. Spicy Orange – Thymus x citriodorus A prostrate needle-leaved thyme that makes an excellent ground cover; great for walkways, curbs, or around the patio; the foliage has a refreshing scent of oranges when walked upon; withstands foot traffic. Lemon – Thymus x citriodorus– Strong lemon scent, trailing habitat. Variegated Lemon – Thymus x citriodorus– Strong lemon scent, trailing habitat. Golden tips make a beautiful plant, works in containers. Rose-Scented – A beautiful creeping thyme that comes up smelling like roses! Forms dense mats that emit a scent very similar to the scent of rose geranium when stepped upon. Excellent for walkways and rockeries. Nutmeg – Thymus praecox articus Pretty small leaved trailing species with an aroma and flavor of nutmeg. Lime – Thymus x citriodorus– Rich green color, lovely lime scent and flavor. We planted a grape this spring in the little triangular bed, now that the trellis is in place. However, it won’t be using much space to start with, so we have some thyme planted along the front edge of the bed. A number of the varieties are your usual suspects – English, French, Lemon, Summer. The ‘Spicy Orange’ will be something a little different. (Usually we end up with the ‘Orange Balsam’ variety.) We also have 3 fairly unique varieties – Caraway, Nutmeg, and Rose-Scented. (Our source for Caraway Thyme fell through, so we have replaced it with Lime thyme.) Basically, these are all thymes that have a strong scent or flavor of another herb or spice rather than just a variation on the regular thyme scent and flavor. It should be fun to have all of them in the garden!